Frozen bread dough makes a handy crust for this chicken-and-pesto-filled tart. On a lightly floured surface, roll bread dough into a 10-inch circle. Place in a greased 11-inch tart pan with a removable bottom, pressing to fit into pan. Prick crust with a fork. Brush with beaten egg. Bake in a 400-degree F. oven for 12 to 15 minutes or until brown. Transfer to a wire rack (leave oven on). Meanwhile, in a large skillet heat oil. Stir-fry chicken, onion, sweet pepper, and lemon-pepper seasoning over medium-high heat for 4 to 5 minutes or until chicken is no longer pink and vegetables are crisp-tender. Spread pesto atop the crust. 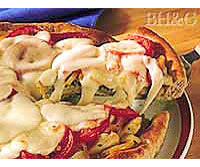 Top with chicken mixture, tomato, and fresh mozzarella. Bake in a 400-degree F. oven for 10 to 15 minutes or until heated through and cheese is melted. Remove from pan; place on a serving platter. Cut into wedges. Makes 6 servings. Calories 404, Total Fat 18 g, Saturated Fat 6 g, Cholesterol 74 mg, Sodium 299 mg, Carbohydrate 38 g, Fiber 1 g, Protein 23 g. Daily Values: Vitamin A 0%, Vitamin C 16%, Calcium 27%, Iron 0%.